The object of the game is to maximize your score within 20 seconds of match play. The robot team with the highest score and with the lowest number of match attempts will win the competition. 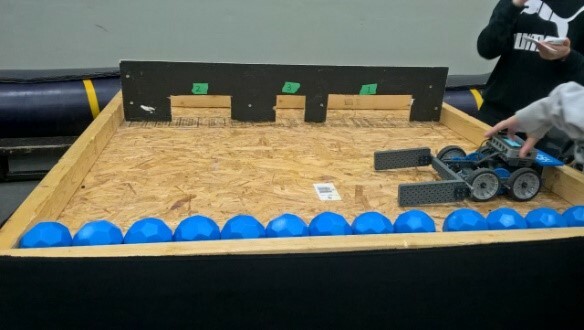 Robot Soccer is played on a ‘4 feet by 4 feet’ robotics table. Robot Soccer is played with one robot at a time competing for the highest score possible. The game objects are VEX-IQ Bucky Balls. There will be 14 Bucky Balls used for each match. First score directly into the widest goal for 1 point. The second method is to score into the mid size goal for 2 points. All drivers must stay within the designated ‘driver zone’ at all times during the 20 seconds’ match play. Robot may expand beyond the size restrictions after the start of the match.